Providing school design teams opportunities to conduct targeted school visits locally and nationally to see quality school programming in action. 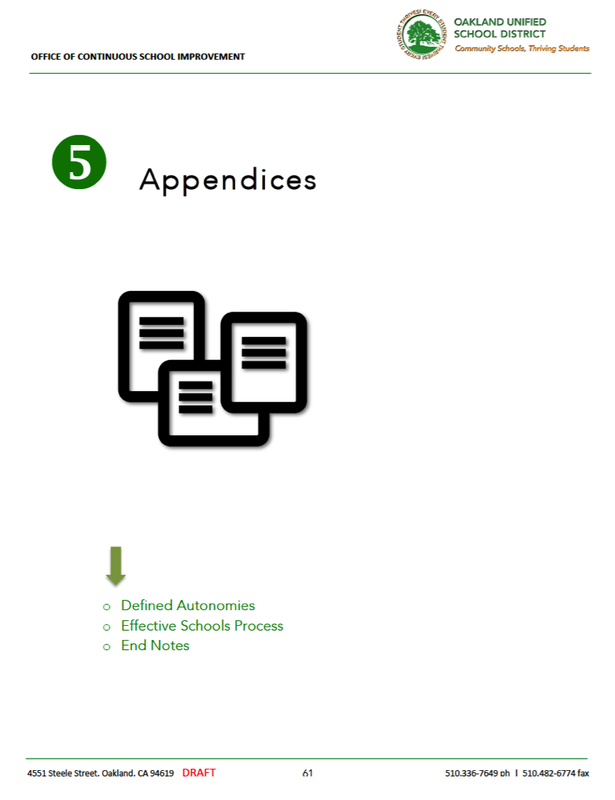 Opportunities will ideally include possible short-term project residencies for design team leaders in local, successful models; studying particular strategies from the inside-out. 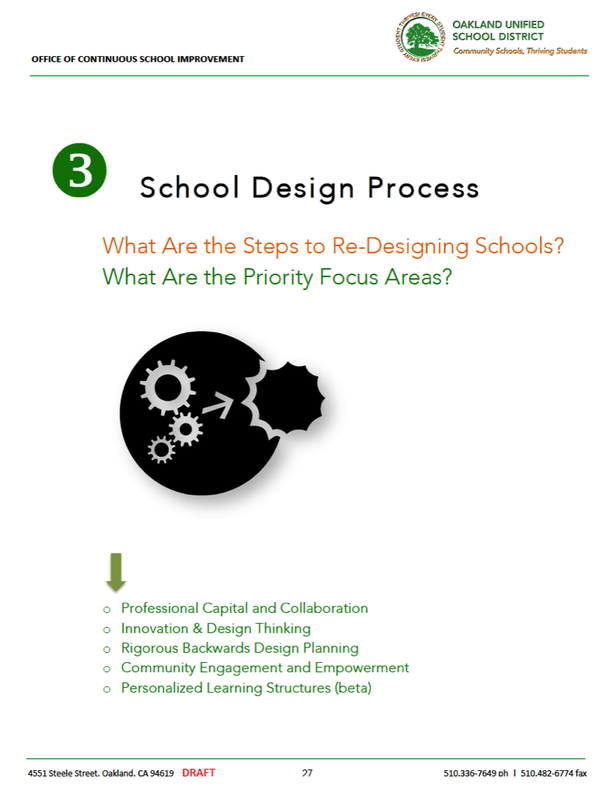 Providing school design teams with workshops, consultations, and protocols to facilitate expert support in developing key components of each school's implementation plan. 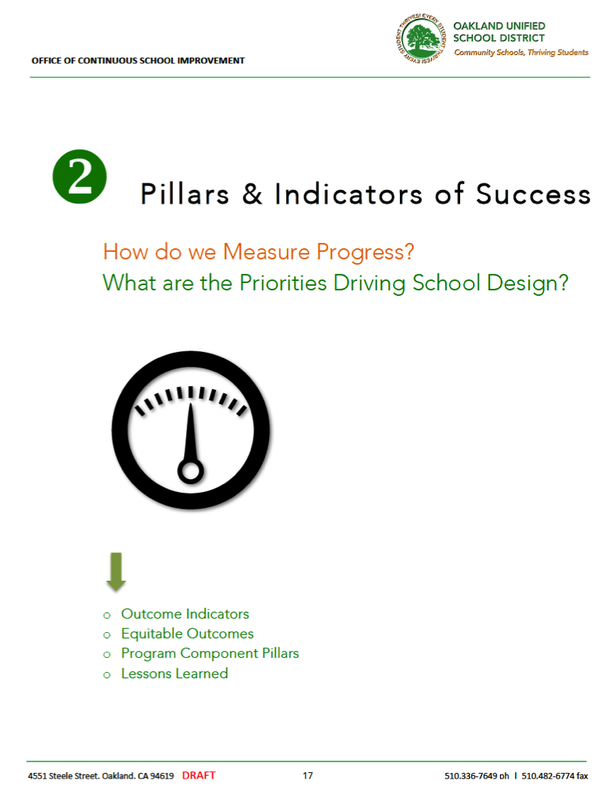 Areas of focus will include leadership, curriculum planning, support for English Learners & language development, special education programs, positive school culture, and use of assessments and performance data. Providing school design teams with support and resources to outreach to local community in supporting of recruiting students and families, as well as networking opportunities with local education support organizations who can assist schools with the implementation of their programs. (Pending...) The Alameda County Office of Education's Integrated Learning Specialist Program works with the OUSD School Design Cohort to provide explore professional learning in Arts Integration, Studio Habits of Mind, Making Learning Visible, Authentic Assessments, and Collaborative Curriculum Design. (Pending...) Big Picture Learning Company works with the OUSD School Design Cohort to provide professional training and leadership development in the areas of personalized learning environments. Oakland's MetWest High School is a Big Picture school and an example of a highly personalized learning environment. The Institute for the Study of Knowledge Management in Education (ISKME) works with the OUSD School Design Cohort to provide training and professional development to school teams in design thinking and addressing design challenges through is "Action Collab" model. Mastery Design Collaborative works with the OUSD School Design Cohorts to provide design blueprints, interactive design sessions and online playlist contents, for schools specifically answering the Fall Call 2015: Dual Language programs. 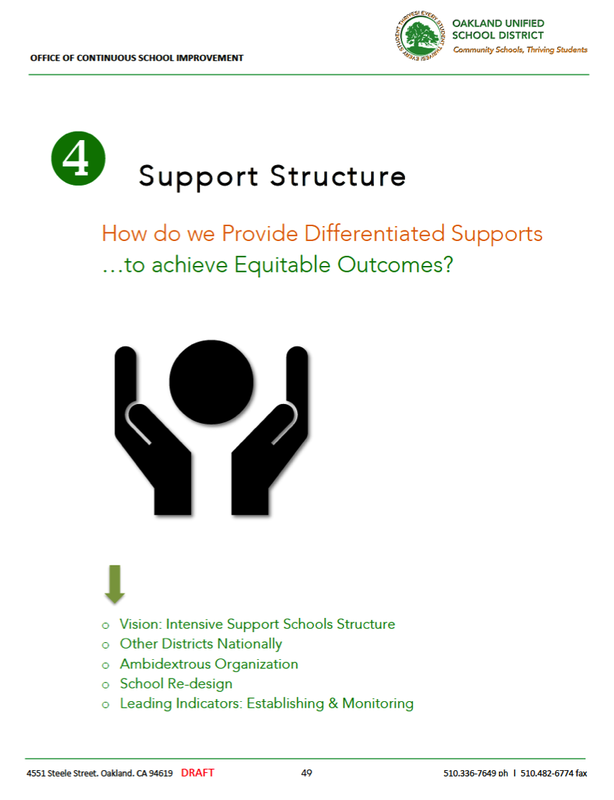 National Equity Project works with the OUSD School Design Cohort to provide professional learning, coaching, and support for school teams and central office leaders to place Leading for Equity at the center of school re-design. 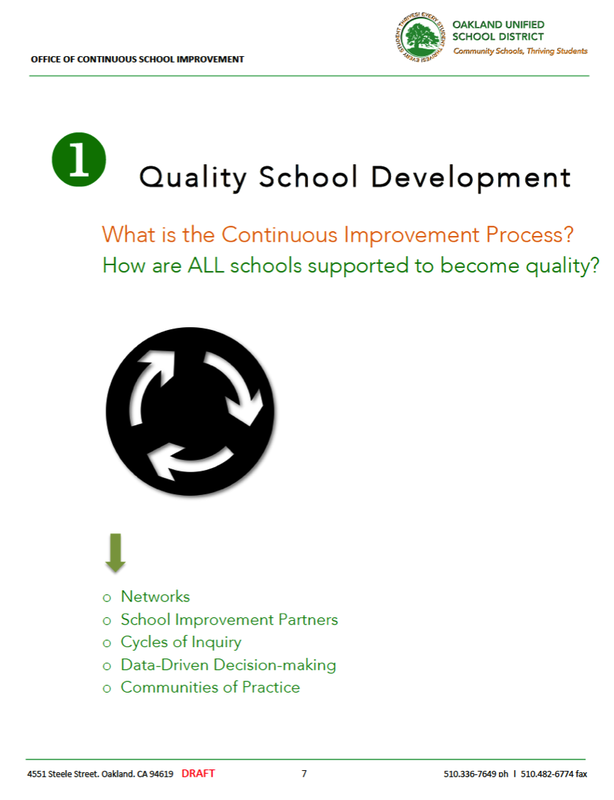 (Pending...) Partners in School Innovation works with the OUSD School Design Cohort to provide strategic coaching, technical assistance and support for school teams and central office leaders to help focus school improvement efforts and build coherence. 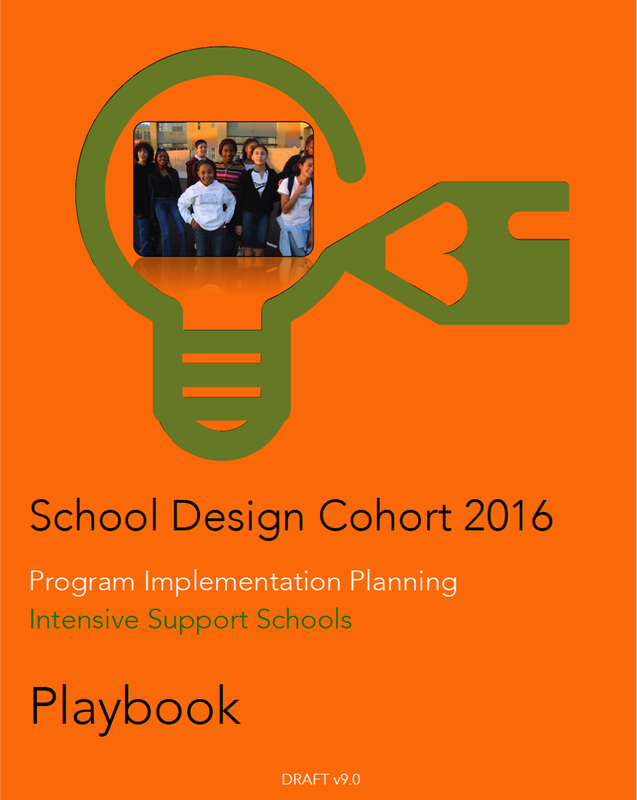 Oakland Community Organizations works with the OUSD School Design Cohort to provide training in conducting 1:1's and Home Visits to support school re-design efforts by deepening engagement with students, families, and the community.